This Monday I casted on for another seed stitch cowl. I have 3 balls of Lion Brand Tweed Stripes in Seashell. 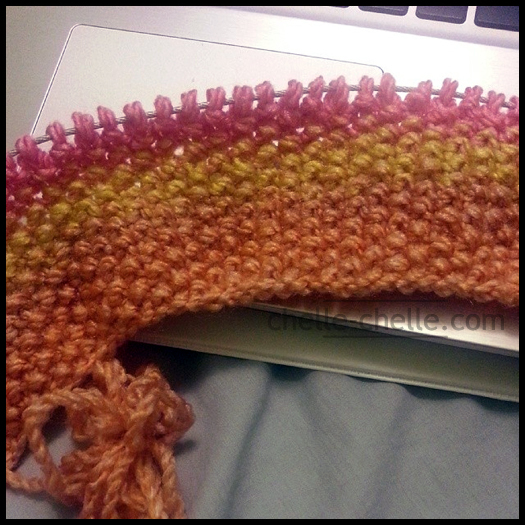 For a 100% acrylic yarn, it’s delightfully soft and squishy. I bought it while it was on clearance/sale, and I’m quite pleased with how it’s turning out so far. 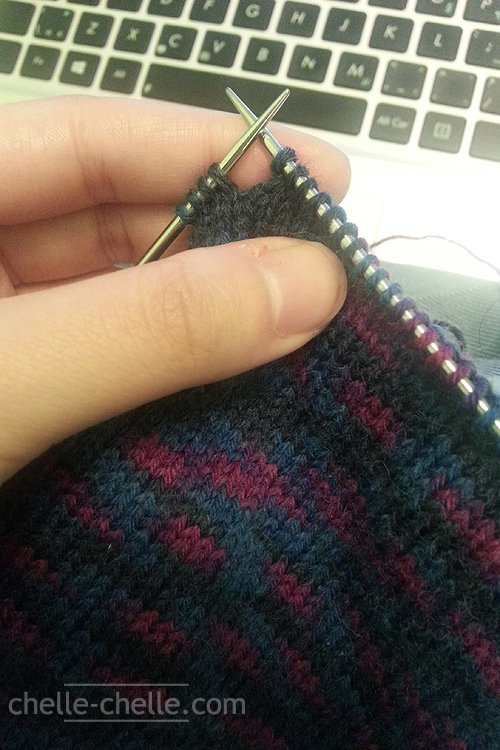 Not much of a pattern though – I cast on 55 stitches, and then it’s seed stitch every single row. I’m planning on knitting on it until I’m completely done all three balls, so it should be a decent length of a cowl that I can loop at least twice around my neck. 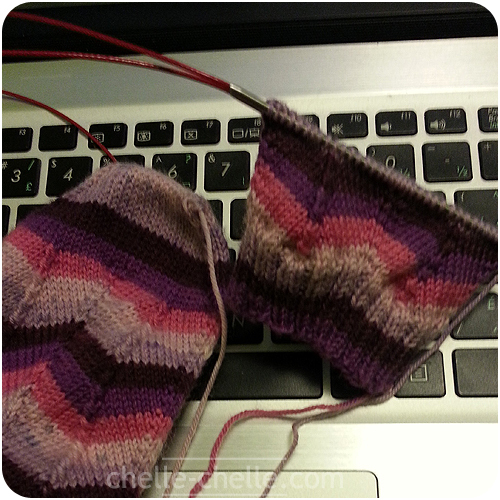 These are being knit on 5.00mm/US 8 circulars – because I hardly ever use straights anymore. 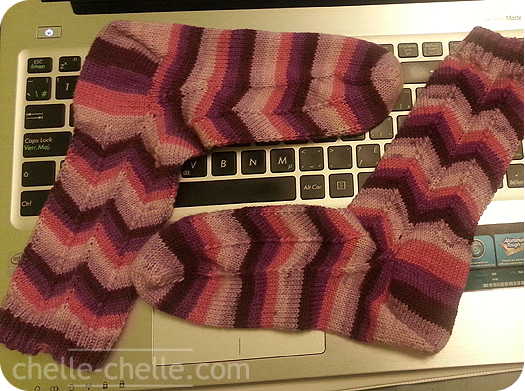 Since the beginning of December, I’m been primarily knitting on my Winter Eclipse socks. So named because that’s the name of the colourway. I am knitting them on 2.25mm circulars (US 1) and the yarn is Patons Kroy Socks 4 Ply in the Winter Eclipse colourway (#54581). This is my second pair out of Patons Kroy and I quite like them. I wasn’t sure about the short colour repeats at first, but it’s got a neat amount of pooling that doesn’t look half bad! I’m particularly in love with the bright berry colours. Majority of the socks are being down in a 3×1 rib pattern, I’m using the Fish Lips Kiss Heel (which I initially found out about from Aimee and Darren’s knitting podcast, Knitting in Circles) which is my absolute most favourite way of knitting heels now. Not that I’ve knitted a lot of heels in the past (or present), but honestly, it’s so much easier than doing a heel flat and gusset and hoping for no holes. These socks are part of my Giftmas knitting and (sadly?) not for me. But fortunately, I will have enough yarn to make a pair for me, if I so decide that I want to knit a pair for me when I’m done. 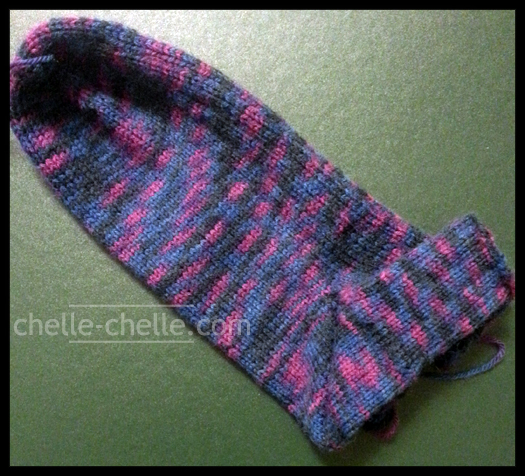 I’m hoping to get the second sock done within the week, ends tucked in, washed and blocked and ready for giftmas-giving. Clinical for the term finished up on Wednesday this week, and we went out for lunch as a group as per tradition. It’s always bittersweet to end clinical for the term, at least for me, because you end up becoming good friends with those that you work with and you know there’s a chance that you won’t be in the same group as them next term. And because I adore all things Christmas, I decided to give my clinical group members gifts this year! Since my last post many days ago, I graduated from university with a B.Sc, started nursing school (yet another B.Sc) and I’m actually nearly halfway through my program! 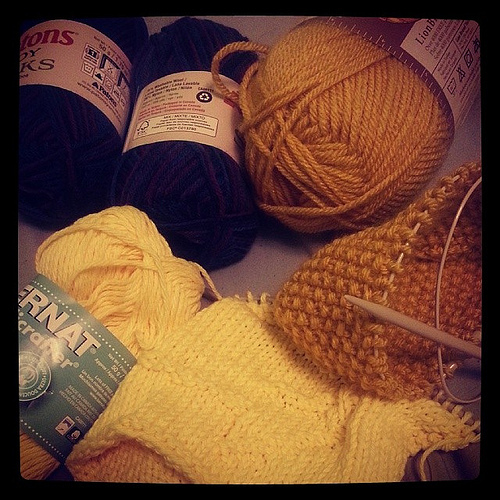 I hadn’t done a lot of crafts in the meanwhile until about a couple months ago when I finally picked up my knitting needles again. I will be sharing those projects that I’ve been working on (and completed) since October of this year and I hope to be more active on this blog as well as publishing more patterns in the near future. I will also be sharing things that I’ve made for Christmas presents this year – so if I know you offline, chances are that you may end up spoiling a surprise for yourself. I plan on doing Works in Progress posts on Wednesdays, Finished Objects posts on Fridays and little things in between.